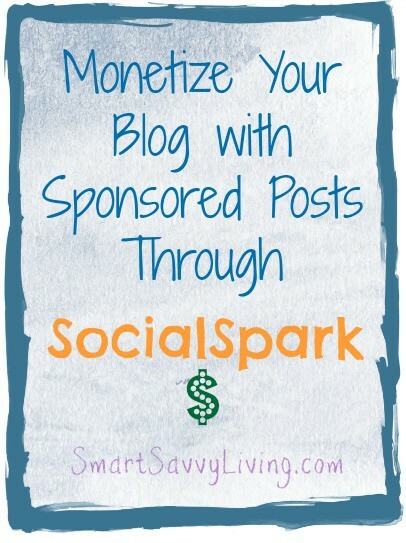 Did you know that you can monetize your blog with sponsored posts through SocialSpark? I adore and feel so lucky to be able to earn a living blogging. To be honest, though, making money blogging isn’t easy – especially if you’re just starting out. That’s why I am always on the look out for new ways to monetize a blog. Even if you are successfully monetizing your blog, I always suggest trying new ways to make income from your blog. If I’ve learned anything in my 2+ years of blogging it’s to never put all your eggs in one basket. What may be awesome today could be not-so-awesome or even gone next month! So, lets see how you can monetize your blog with sponsored posts through SocialSpark. What exactly is a sponsored post? A sponsored post is an advertisement where you are paid to write about a product, service, website, etc. These differ from reviews because you are usually given monetary compensation to write about the subject versus product payment and you may or may not have personal or hands-on experience with the subject. It can be tough to find quality sponsored post opportunities on a regular basis, especially just starting out. That’s why I suggest (and do so myself) to sign up for a few of the sponsored post networks out there. One of my favorites is SocialSpark. Why exactly is it one of my favorites? As with anything, there are also a few things I’m less than thrilled with which I think you should be aware of. Payment can be on the low side (while my suggested price in the SocialSpark settings is over $60, I usually get offers for $25 and under) – Update May 2013: I originally wrote this post in Oct 2012 – since then payment structures have been revamped and new users may only receive as little as $5-15 per post. However, you can negotiate the payment. In the past couple months my traffic has increased and I now get an average of $75 per post. It seems you need a 3-month average of 30k – 50k pv a month to get to this tier. All in all, I think the good outweighs the negative with SocialSpark – as long as you can get paid a fair amount for your posts. I definitely enjoy working with the network more now that what I get paid for each post is eligible for payout without having to pay a fee. Disclosure: I was not paid to write this post – I wanted to share one of the many ways I monetize Smart Savvy Living. However, links in the post may be affiliate links where I can earn money from when someone signs up through them. I hope you enjoyed this post about how to Monetize Your Blog with Sponsored Posts Through SocialSpark – check out our other posts about blogging! Just started to use this site on y travel blog so thank you for the tips. Hi Michelle! Great post about Social Spark. I am actually thinking to register my blog in Social Spark but I would like to ask one thing, do they accept publishers outside the US? I am currently in the Philippines but I do have a Paypal account. Thanks so much for taking the time to put down your thoughts about working with SocialSpark! I think you encapsulated the system well pointing out the strengths and weaknesses. The only correction I wanted to point out is that in SocialSpark each point equals a penny, so in your example, 1,000 points would equal $10 rather than $1.